When I was eight years old my family took a long summer road trip through Arizona, Utah, Colorado and New Mexico. Late one evening, we were driving through Arizona during a rain storm. There was so much rain that off in the distance, several miles away, it looked like a long gray curtain stretching out over the desert. My mom and brother were asleep in the back seats, so only my dad and I saw the rain. In those minutes before we entered the dense rain cloud, I couldn't imagine us driving through it. We were barreling toward this gray mass on the highway, but I couldn't see us coming out the other side because it seemed more like a wall built from the ground up, not something you could pull back like tucking a piece of loose hair behind your ear and push through unscathed. Of course, we did. We drove through it and arrived at our next destination as if the rain had never been an obstacle at all. The fear did not claim victory. 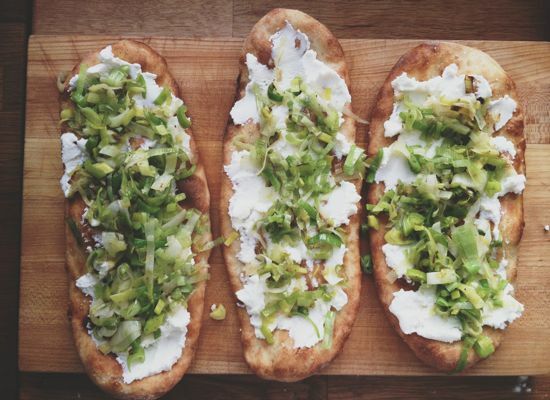 This story was fresh in my mind when Ashley Rodriguez wrote about fear in a recent post and also offered a simple recipe of melted leeks with ricotta, which I've taken inspiration from for today's post. Turning back to fear, here's what she had to say about the topic.